Omg!!! I love my photos! They are so great! These guys were wonderful! Honestly, they made the entire experience as smooth as butter! I couldn’t have asked for more kind and helpful people to surround myself with on my wedding day!! Lisa and Paul are amazing photographers to work with! They are very flexible, experienced, accommodating and personable. Thanks to them, the headshot photography process during our 2 day conference was very smooth and efficient and they made all our attendees feel very comfortable. Our portrait headshots (perfectly retouched by them) and event photos turned out beautifully. Paul and Lisa were great to work with and delivered just what we needed for our professional head shots. We're very happy with their professionalism and the work that they do! Top notch professional Photographers. You cant get better - Thank yo u Paul's Vegas Photography! You made us all look GREAT!! Lisa and Paul were fantastic to work with the whole way through! They were very quick to respond via Thumbtack, phone call, and email to clarify the details of our project. They easily accommodated all of my parameters and special requests, and were communicative throughout the process. The end results were fantastic quality, and they made a rough property look fancy. I highly recommend Lisa and Paul for any photography project in the Las Vegas area and will definitely work with them again in the future! Paul and his wife where excellent.They knew exactly what to shoot and shot it beautifully. Great job, very professional, would hire again. Great response time, completely understood the vision and had an amazing turnaround time. Super happy with the results. Paul and Lisa were excellent to work with and loved having them as part of our big day! I'm only giving Paul a 5 star review because Facebook wont let me give him 6 out of 5. To say Paul and Lisa are amazing at what they do would be an understatement. And as great as they are as photographers, they are even better people. The work they did capturing pictures of my bride and I is almost indescribable. I cant recommend them enough. Thank you Paul and Lisa!! It's rare to find a photographer who can do both candid and posed shots in the same venue, and with Paul and Lisa, we got TWO of them! They were extremely friendly, professional AND helpful, documenting more tears of joy and laughs of fulfillment in their time with us than other photographers ever would or could. From multiple pre-wedding check-ins to staying late to make sure we got everything we wanted, our day was captured for eternity the exact way we wanted. I know whom I'm calling any time I need a photographer, and I know with Lisa and Paul I will never be disappointed. Thank You from the bottom of our hearts. Highly recommend Paul and Lisa for your next photography session! Truly appreciate the flexibility in their schedule and immediate responsiveness! Very fast turn-around and highly satisfied with the final product. Thank You! Incredible team and professional I would highly recommend Paul’s Vegas Photography! I could not say enough GREAT things about our experience with them, both Paul and Lisa went beyond our expectations! So worth the $'s spent to get professionals who know what they are doing! We met up with them in their studio space and did some pre-wedding shots, they came to our actual wedding and not only did stills but filmed the whole event too! We went with the editing feature that they offered and were absolutely blown away by the clever way they weaved our James Bond theme into the end product! If we could give them 20 stars we would! We used them a 2nd time to get some great promo shots for both Ricardo and I and once again they delivered far beyond the call of duty! Courteous and professional, to care to listen to what I needed and delivered. Will definitely use Paul again in the future. Paul was Awesome �� !! He captured every precious moment of my 50th Birthday Celebrations. The team was incredibly easy and fun to work with and turned our photos around SO quickly. We recommend them to anyone and everyone! Paul and Lisa were wonderful! Professional, courteous, fun, and delivered our pictures in a couple weeks. 100% recommendation from Bridgette and Jack! Lisa and Paul were absolutely amazing! They know what their doing! I cannot not wait to see how our wedding day photos!!! I got sneak peaks during the photo shoot after our ceremony and they were so amazing! Not only did they communicate well with me, but they worked together to make sure that they both got the most amazing shots. They worked so well together with my wedding coordinator and the DJ to make sure everything was moving along perfectly. Thank you Lisa and Paul for capturing the moments in one of the most important days of my life! You definitely exceeded my expectations and I got a lot of compliments from my wedding guests! It was the perfect day! Having Paul and Lisa shoot our wedding was a great experience. Both of us were very pleased with the entire process from booking our wedding, to getting info regarding location options. They even scheduled a Minister(Janet) who made our wedding so memorable. Working with Paul and Lisa during the wedding shoot was very easy and the quality of the finished photos was all above expectations. We are both so glad with the decision to go with Paul's Vegas Photography and would highly recommend them. I just had my wedding on 7/7, Lisa and Paul were fantastic! They took plenty of pictures. Lisa was even nice enough to help with coordinating with my DJ! You won't be disappointed with them! And the fact you get TWO photographers is so nice! They had experience with my venue and gave me a lot of value for the time and money I spent with them. Very professional service with high quality photography and timely photograph returns. Paul, Lisa and Matthew did an outstanding job. They are reliable, very talented, dedicated and it is very easy to work with them. I would highly recommend. Paul and Lisa photographed my wedding! I haven't seen the pictures yet but I know they'll be amazing! Every time I looked up there was Paul or Lisa making sure that moment was captured! I felt totally comfortable with them like I had known them for years! I highly recommend Paul's Photography to anyone! Paul and Lisa were everything I expected and so much more! They were organized, punctual and helped us every step of the way, even going above and beyond to assure me things were running smoothly when I was unable to check for myself. These photographers really know what they are doing and I couldn't be happier knowing I picked the right team for our special day! It was awesome having both of them, Lisa was able to come with me and my girls and Paul went with the groom and groomsmen, there's not a moment that got missed. Thank you again Paul and Lisa, it was such a pleasure working with you and I can't wait to see all the amazing moments you captured! Paul and Lisa did everything possible to get the best pictures to commemorate our special day. There are simply no words that can describe how amazing Paul's wedding photos came out for my wedding! He's truly gifted and has a natural eye for beauty as well as capturing the moment. He also knows all of the great shoot locations within Vegas and everyone in my family loved our pictures. Professionally, Paul is exceedingly kind and patient. He has a great sense of humor which, was great for bringing out my wife's best smile! The turnaround time to receive all of the photos was pretty quick as well. An overall great experience and he easily rates 5 stars. Thank you again! Wow: what a fab experience! We hired Paul and Lisa to shoot our vow renewal and boy are we glad we did. They were quick and easy to communicate with over email and had great suggestions with regards to the shoot. When we met in person it really felt like we already knew eachother so well. They made our whole wedding party feel so much at ease. The shoot was a blast and an absolute highlight of the day: we were laughing so much! It is great that they work together: we have wonderful shots of the ceremony from all angles. They really captured the atmosphere of the moment so well. Paul will do whatever it takes to get that right angle: even lying on his stomach in the middle of the road if that's needed :) The pictures are great and it is such a bonus that we got all the high resolution pictures through dropbox. Makes it easy as we live in Europe. This way we can print whatever we like. We highly recommend hiring them. Thanks Lisa and Paul for being part of our big day and for doing such a great job! Everything was top notch,how they interacted with guests was superb.we talked for a few mins at the start and just let them get on with what they do best.a joy to work with. Paul and Lisa were amazing to work with. They worked very hard to give us excellent wedding pictures and took great care to make sure we had all of the photos we wanted. Paul and Lisa are amazing! The preview of the pictures are exactly what I wanted. With just one phone call our entire wedding came together. They recommended the officiant and the venue. It truly couldn't have been easier and our day was perfect! Absolutely perfect! Thank you, thank you, thank you! We felt very confident that Paul's Vegas Photography would be a great fit for us from our first conversation which, by the way, came almost immediately after we requested bids via Thumtack. Very detailed, very thorough and best of all, completely professional. Paul and Lisa were both at our event and arrived early to make sure they could set up properly. They also secured a videographer for us who was also early and very professional. The three made a wonderful team photographing our event and made sure they knew in advance the type of photos we envisioned and catered to every request. The three had were friendly and warm and added a wonderful spirit to our day. We have not seen the final products yet but have every confidence that the photos and video will be amazing. We recommend this team highly! Paul and Lisa are absolutely amazing. Not only are they friendly, but they are very professional. I will be sure to contact them should I ever need photography services again. Paul and Lisa were AMAZING, I love them, very professional, friendly and on time. I was recommend them to any one who is getting married. Lisa and Paul were very friendly and accommodating. I had them do a boudoir photo shoot as well as my wedding video. During the photo shoot they made me feel very comfortable and I had a lot of fun. They helped with wardrobe and poses, which I had no idea what I was doing. The pictures came out amazing and they stayed in constant contact with me through out the process. The video of my wedding was all I could ask for, it was beautifully done and once again they were in constant contact through out the editing process. They were very friendly and approachable. They were also understanding with my crazy schedule due to the fact that my wedding was a destination wedding. I received the photo book and wedding video promptly. This guys are amazing!!! Great job! Paul and his lovely team were wonderful to work with. They communicated frequently, arrived promptly on our wedding day, and were ultimate professionals, yet very personable. It felt like a team of friends came to help make our special day the best possible. We had a small, intimate ceremony, which they captured perfectly. There are so many photos of all the moments and emotions--smiles, laughter, tears and most of all, love. Our photos arrived earlier than promised by email and also a flash drive came in the mail. My husband and I highly recommend Paul's Vegas Photography!! Paul and Lisa were the MVPs of our wedding. It was very clear from the beginning that they love what they do and were there to make your special day even more special. We threw our wedding together last minute and they provided so much more than photography. From organizing the ceremony to providing a reference for an officiant, they were so accommodating and helpful! The turn around to seeing the photos on Dropbox was fast and convenient as well. We were luck to find Paul and Lisa for our wedding and consider yourself lucky if you land them for yours! Paula and Lisa were amazing. I would completely recommend them to anyone. Our team was very impressed by Paul and Lisa's professionalism and performance throughout the event. We booked our event last minute and they responded very quickly and made the entire process painless. We will definitely use them again and strongly recommend Paul's Vegas Photography moving forward. Easy to deal with, very friendly and great shots. Thank you for your help! I'm so glad I chose Paul and Lisa from Paul's Vegas Photography to take pictures of my parents' 50th Wedding Anniversary and reception. They were competitively priced, responsive and flexible in splitting their time between two venues at different times in the day. Paul and Lisa are professional, show up on time, and they were extremely patient with the endless requests for group table photos with the almost 200 guests! They took plenty of pictures during the vow renewal and reception and every moment was captured. The pictures turned out great and we'll be looking back at the photos for years to come remembering what a great time everyone had with family and friends! I would highly recommend Paul's Vegas Photography. I hired Paul and Lisa for my wedding and it's the best decision I have made because their work is absolutely spectacular! They exceeded with my expectations in capturing the moments of our special day. They are very easy to work with, very nice and friendly people. I would definitely recommend them to friends who are looking for professional photographers. I hired Paul's Vegas Photography for my sister's wedding and was blown away by them. They were super professional and made sure to stay in contact with me throughout the process. They were so aware of our individual needs by asking if there was anything that we wanted to see or any particular poses we wanted. I appreciated the way they knew how to handle our large family in such a way it wasn't exhausting and getting pictures done was enjoyable. I can't wait to see the pictures. Thank You!!! Loved these two! Made everything super easy for a small and simple wedding. The pictures so far are outstanding. Keep a fun and cheery atmosphere. We be using them again while I live here. I couldn't be more happy with choosing Paul and Lisa as my photographers. They helped us out soooo much and made sure everything went smoothly! You 2 were AMAZING!!!! THANK YOU!!!!! Excellent work, adapted very quickly to a constant changing environment. Fantastic to work with, easy going and willing to accommodate all requests! What a fab team! Paul and his wife Lisa did an outstanding job. Not only did they take beautiful pictures but the are very personable and do their best to accommodate your wishes. They are very easy to work with and I can't say enough about their professionalism. I will recommend them to everyone I know. These couple made our wedding unforgettable. They kept in touched with us to make sure they get the photograph details that we want to have. Lisa made sure I look fabulous. She was like my mother on my wedding day. She made it a point that my wedding dress looked flawless the whole time. She kept fixing my veil, helped in lacing up my dress and even advised me to add more blush and lipstick. She was like a mother to me!! Paul and Lisa, from the time we were booking them to the day I did the boudoir with Lisa up to the Wedding Day, they were so much like a family to me and my husband. We did not only talked about the wedding but shared personal stories as well which I think made a big impact with the outcome of the pictures. We felt extremely relaxed and comfortable while they take pictures of us. They have been very open with our suggestions. To top it all, we had more than what we paid for! We were only expecting them both on the site but they brought another guy with them and captured our moment as well! I will Highly recommend Paulâ€™s Vegas Photography anytime, any day at any occasion. You can never go wrong with these awesome duo. Thank you so much!! I hired Paul and Lisa to do photos for our very last minute Las Vegas elopement. We were married at the grace land wedding chapel which provided photos of the ceremony but nothing else. Because we didn't include family or friends at our wedding I wanted to make sure we had lots of photos to share with them. I wanted pictures on the strip and in front of the welcom to Las Vegas sign. Paul and Lisa exceeded my expectations! First of all they are hands down the nicest people EVER! They were waiting for us at the chapel immediately after our wedding and greeted us with hugs and congratulations. They had a plan of attack to capture all of our requested photos and were incredibly organized. I had shared with them prior to our session that there is a huge height difference between my husband and I (he's 6'5 and I'm 5'2) and they were prepared with a step ladder. They made our experience so much fun and from what I've seen so far they are the best pictures I've ever had taken of myself. Our photo session went from 6:30pm to about 9:00pm and they were able to share photos with us by 10:00pm. I seriously love every photo they've shared so far and I'm super excited to see the rest of them. They even were able to photoshop some of our Graceland pictures because my husbands jacket was very crumpled and my feet were whiter than my wedding dress! If I could rate Paul and Lisa ten stars I would. My daughter is 16 this year and I will be seriously considering using them for her senior pictures even though we will have to travel to Las Vegas! They are awesome!!! I highly recommend them! They take awesome pictures had some great ideas. Tons of pictures to choose from! On time and they worked fast and did over and beyond...Paul and Lisa did a fantastic job at making sure we get the very best! Love, love working with Paul and Lisa!!!! There were very professional, knew their job and I will reccomend them to other in my company and friends!!!!!! EXCELLENT!!!! Lisa and Paul did such a great job taking pictures. They are easy to talk to and helped more than just taking pictures, such as lacing up my wedding dress. I highly recommended them!! Thank You, I'll be forever grateful!! 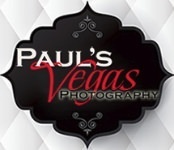 Paul's Vegas Photography was chosen as photographers for our daughter's Las Vegas wedding. They exceeded our expectations. They provided two exceptional photographers. Both were friendly, easy to talk to, professional, and we'll prepared. The event site was a new venue for them. They prepared by meeting with the restaurant manager and reviewing the site a day prior to the wedding. The photographers had excellent timing. They covered all the major events. They knew the timing of events and covered them thoroughly. They utilized time between events to complete both candid and posed photographs. We couldn't be more pleased with our choice Paul's Vegas Photographers. The quality of their service and the actual photographs were exceptional. We would recommend their services to anyone needing a professional photographer in Las Vegas. These are such nice and generous people. What a wonderful addition to our event. Paul and Lisa knew the area and had recommendations for the best locations and use of our time. They even drove us to the Welcome to Las Vegas sign for photos! The pictures turned out great and we couldn't be happier; a great value for a great team! Paul and Lisa are amazing! They did a wonderful job accommodating our needs. They took amazing pictures and were fun to working work with. I highly recommend them! They were heaven sent photographers the best we highly recommend them!!! Paul and his wife were so great to work with. They are very structured and clear and made sure they got every shot that they could. I'm so happy with the photos. They didn't miss much, if anything. If you're looking for a photographer to go unnoticed or be less visible at your wedding, say so upfront - otherwise the photo-taking may overtake the guest experience. They were available at short notice and were flexible with their time. Paul's capability to read and apply lighting is nearly flawless! The lighting was perfect in his photos! I would definitely hire them again in a heartbeat. Paul, Lisa and the team were exceptional! They were professional and were extremely flexible on our schedule. Lisa was very helpful and genuine in meeting our needs, and Paul took wonderful, quality photos and video. The team provided video and photo services for my parent's 46th anniversary which spanned two days. Although we had hiccups on our end Paul and his team were professional and I didn't have to worry about missing a special moment! Thanks Paul, Lisa, and your team! I will definitely recommend and use them again! Thank you! Very personable, friendly & thorough! Willing to go the extra mile to build a custom backdrop for us! Phenomenal!! Punctual and a professional. He took pictures from all sorts of angles and new the Vegas strip well. I could tell he has a passion for photography. I would higher him again in a heartbeat. Paul photographed our parents' golden wedding anniversary celebration. Paul and Lisa were great to work with; very approachable and reliable. Paul responded to my phone calls and emails promptly and was very flexible. They were easy to work with, and were very punctual. The photos came out great, got quality pics that were delivered on time, as promised. Thank you Paul and Lisa for making this celebration easier for us. My family and I are grateful for the impressive work and professional services you rendered. I highly recommend Paul's Vegas Photography. Paul and Lisa (they work together) were the photographers at my brother's destination wedding in Las Vegas on January 10,2015. My brother and his fiancé were visiting from Russia and didn't speak much English so I was the one to book the photographer and do most of the communication regarding the photo shoot. Now I realize HOW lucky we got to have Paul and Lisa available on the day we needed them (we booked everything last minute, including the photographer). First, I would like to mention how flexible they were with time on the BIG day. Since we were not sure what time we would be done at the chapel, they told us they would be waiting for us to be done and came to pick us up within 5 minutes after my phone call (conveniently, they offer the transportation to the couple to get to the photoshoot spots). Second, they are very pleasant and easy people to work with. They made the newlyweds feel very comfortable and relaxed during the entire time of the photo shoot despite the fact they didn't speak the same language. Third, and of course, the most important, the pictures came out GREAT! They did some touch ups where were needed (at no extra charge) and provided two versions of resolutions for our convenience. They were also kind enough to send us few pictures the same day so we could share them with the rest of the family who were not present at the wedding. Since none of the parents or other close family members and friends were at the wedding, this was VERY THOUGHTFUL and sweet of them and we highly appreciate it!!!! Few other facts I would like to mention that, in our opinion, make Paul and Lisa's services outstanding. They are very quick with getting the final pictures ready for you. They LISTEN and HEAR you and your photo shoot preferences (trust me it means A LOT since it is YOUR BIG day and you want everything to be done the way you dreamt of it)) And, once again, the combination of their talents and quality equipment they use gives you an outcome in form of GREAT PICTURES (and trust me, I am very picky when it comes to pictures and what the good wedding pictures should look like). And the last, but not the least, their services are priced more than reasonable. I got few quotes from several freelance photographers so I had a chance to compare. You get a great deal along with the quality pictures and beautiful memories for the rest of you life! I highly recommend Paul and Lisa's services for your wedding or other photographic needs! You will be more than happy with the job they do! Awesome communication! amazing pictures! Super happy we went with him and his wife Lisa. Paul and Lisa were fabulous to work with. I changed what I wanteda few days before the wedding. No problem they were able to accomedate my requests. They did a fantastic job taking photos and captured even the intimate moments when our guard was down. Although I have not seen all of the photos what I have received has blown me away. The depth of feeling and emotions that they captured are un unbelievable. They are punctual and knowlegable about great places to shoot. The fees are more than reasonable. The quality of the work is first class. I highly recommend this team. You will be blown away. Incredible photographers and wonderful people! My husband and I hired Paul for our wedding photos when we traveled to Las Vegas. He was very professional, courteous and knowledgeable of the "tourist photo spots" as well as some areas that the locals aren't aware of. We agreed on 4 hours total, broken up on two different days, since our ceremony was going to be very short (no bridal party, no getting ready shots, etc,). Next time we are in LV we will definitely use Paul again. Paul and Lisa delivered beyond my expectations. They were prompt professional and friendly. They delivered great pictures to my clients. They are a gem. Paul and Lisa were amazing! They were able to work around every obstacle that arouse during our ceremony. They are helpful, friendly, and professional. We had a blast getting photos around the city with them. We highly recommend them! Paul and Lisa were awesome to work with! Very outgoing, helpful and knowledgeable! Their work was a bargain at double the price! I would highly recommend Paul's Vegas Photography to anyone needing their wedding or any other event captured in photos! Paul and Lisa are awesome!! They made everything go smoothly and we didn't have to worry about anything! They were prepared and flexible! Everyone in our wedding party said they loved them!! Our photos are awesome!! We really couldn't have asked for better photographers and just people in general to work with!! We had a blast! Our experience with Paul and Lisa My husband and I would like to share our experience with Paul and Lisa from Paul’s Vegas Photography. They shot our wedding on September 14, 2014 in Las Vegas. With this review we would like to appreciate their work. Getting in touch While comparing different photographers, Paul and Lisa made an impression on us from the very beginning. Not only was their bid a personal and individual text (not a standardized one like some others), but also they explained to us that Paul and Lisa (almost) always shoot together to make sure that no angle of a good photo perspective gets lost. Their dedication for their work stood out, which we liked, so we decided to book them. Preparations from Germany Paul and Lisa emailed us a contract and offered their help if we needed any assistance. They arranged a hair and makeup artist for us to come to our hotel on our wedding day and made sure that everything else is settled. Whenever I emailed them, I received an answer right away, which made us feel being cared for unconditionally. Also they put a lot of effort to find a suitable location and suggested a marriage reverend called Tammy Engel for us to conduct the ceremony, which was very helpful. All in all, we felt in really good hands, which is certainly what you wish for one of your most memorable days :-) First meeting When we arrived in Las Vegas a few days before our wedding, Paul und Lisa suggested to meet up to discuss the last details and to get to know each other before the big day. We had a lovely chat in a bar - Paul, thanks again for paying our drinks! - and we had the feeling of meeting good friends instead of two complete strangers. Paul and Lisa have a special charisma, it’s not hard to feel comfortable around them. They were very attentive to our wishes and worries and even thought about a variety of extraordinary places where we could do the shooting so we would have pictures to remember. They also pay great attention to things like restrictions where it’s legal to shoot and where not and everything else that an amateur photographer might possibly not think of. So knowing that they have years of experience made us feel even more in good hands. The big day After having arranged everything in advance, they picked us up at our hotel and our photo shooting began. Paul and Lisa brought two cameras, light and other equipment and were very professional, patient and creative. We didn’t have to care about getting to the spots in Las Vegas since Paul drove us everywhere in his car. Since we both didn’t have any experience in “modeling”, it was a great help that Paul and Lisa always told us where to stand, where to put our hands and where to look. But they were also very welcoming when we contributed own ideas of how to pose for the camera. For us, it was a fantastic experience to enjoy our wedding day while Paul and Lisa did all the work :-) Receiving the photos Shortly after the wedding, Paul and Lisa emailed us some first impressions of the shooting to send them to our families and friends at home, which is a very nice touch, I think. After three weeks of our USA west coast round trip we came back to Las Vegas and Paul told us that he had finished the photos by that time. So we met him in his studio and received a CD of more than 200 pictures – most of them edited. Words are not enough to praise the quality of them. The use of light, of perspectives, of angles, etc. are just perfect. We were extremely proud to show them to everybody at home and received tons of compliments. Also we would like to thank Tammy and Paul again for helping us with the bureaucratic work that came up after the wedding since we had to leave the USA soon. Résumé If we were to choose a photographer for a wedding or any other event in the region of Las Vegas, we would definitely contact Paul and Lisa again. We can recommend them unconditionally. They are friendly, experienced, professional, funny, helpful, generous, and attentive. Our wedding pictures came out great and that is exactly what we wished for our once-in-a-lifetime wedding day! Thank you very much! Paul and Lisa were AMAZING!!! They even let us change our scheduled time last minute and picked us up at our hotel. Lisa took really good care of us and even offered to make our dinner reservation for us on our Wedding night. Our pictures turned out great. We've had a million compliments on them, they are PERFECT! I highly recommend these two. They were a lot of FUN and really added to our special day! 5 STARS ++ for sure!!! Thanks again you two! Sorry it too so long for Jeff and I to write our review! We could never forget you! Paul and Lisa were the ultimate tag team! They did all the thinking for us and captured amazing moments in our wedding. We had a very unconventional wedding with a difficult setting and strict times, but they delivered and with such an awesome attitude. They are funny, witty, and will be there for you every step of the way. I highly recommend their services! We're so grateful for all their accommodations!! Our experience with Paul and his wife was a wonderful one from start to finish. They were always very professional and easy to work with and did a great job shooting for our corporate event. They were ALWAYS timely with answers to any questions I had which was so appreciated. I hired Paul's Vegas Photography and thought they were GREAT! They were early and had everything handled. We even ran into a problem and they jumped in to help make our event the success it was. They got along with all the guests and delivered our images on time. We highly recommend this team as they were outstanding. I recently worked with Lisa on a boudoir photo shoot and had the most AMAZING experience of my life! I would high recommend this duo for any special moments. The level of professionalism was outstanding. Lisa made me feel so comfortable and allowed me to show as little as much as I was comfortable with. For anyone out there I would definitely recommend this duo! Thank you so much. One absolutely satisfied customer. We are so happy about his work!!! He gave us very reasonable qoute, but he spent a more time than he supposed to be. He made us so confortable, all picture are came up great. See you next time, Paul!